The McHale Fusion Vario is a fully integrated baler wrapper, which consists of a high output variable chamber baler with an integrated wrapping ring. 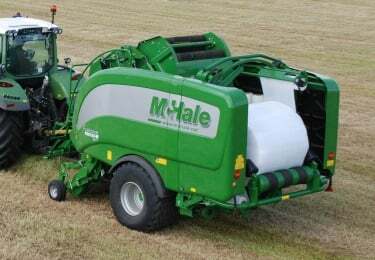 The McHale Fusion Vario has the ability to make bales of hay and straw from 0.6 metres up to 1.68 metres or from 2′ up to 5′ 6″ . The McHale Fusion Vario can also produce bales of haylage or silage from 1.1 metres up to 1.45 metres or 3′ 3″ up to 4′ 8″ . As the transfer cradle moves the bale towards the wrapping ring, the wrapping roller closest to the bale chamber pivots out of the way which reduces the height the bale has to travel to get to the wrapper. This clever system saves time, as the patented system moves the bale quickly ensuring the McHale Fusion Vario delivers the highest possible output. The McHale Fusion Vario can wrap bales from 1.1 metres up to 1.45 metres with ease. The patented tip roller adjusts its height in line with bale size to ensure the plastic always goes onto the centre of the bale, regardless of the bale diameter. This ensures the correct overlap is always achieved. This high-speed vertical wrapping ring can apply four layers of film to a 1.25 metre bale in approximately 20 seconds or six layers of film in 30 seconds. In normal working conditions the ever efficient wrapping process is always complete ahead of the baler, meaning that the wrapping platform is always ready and waiting to capture the next ejected bale. The McHale Fusion Vario is a fully automatic baler wrapper. The i Touch incab control console, provides clear indicators of machine performance on its large touch screen graphic display. The i Touch control console, when combined with the load sensing valve on the Fusion Vario, is capable of making baler & wrapping operation fully automatic. The i Touch control console is fitted with a rear camera as standard. In automatic mode the camera image will appear at different predetermined times on the screen such as when the bale is being transferred or being tipped. When tipping the bale the rear wrapping roller moves downwards and the Fusion Vario places its tightly wrapped bale gently on to the ground. With the optional side tip the bale can be rotated through 90 degrees and placed on its end, thereby reducing stalk damage from crops such as Alfalfa. The vertical wrapping ring on the Fusion Vario integrated baler wrapper is fitted with two 750mm dispensers, which take approximately 20 seconds to apply 4 layers of film and 30 seconds to apply six layers of film using both dispensers. This means the wrapping platform is always waiting for the next bale. The dispensers are fitted with film break sensors, which notify the operator through the control box in the tractor cab if one or both dispensers run out of film. If one dispenser runs out of film the Fusion Vario will continue working and automatically slow bale rotation and increase the number of rotations of the wrapping ring to ensure that the round bale is wrapped correctly. Film can be loaded from the left hand side of the machine. After loading film on the first dispenser, the operator can push the index button and the dispensers will then rotate around and automatically stop at the loading position for the second dispenser. This allows the operator to easily load the second roll of film. Electronics 12 Volt DC, 15 amp approx. Angus Wielkopolski runs two mixed arable and livestock farms in Yorkshire. The two farms are 40 miles apart and on one farm Angus runs a Fusion 3 and on the other farm Angus runs a Fusion Vario. When Kellie Berry is baling and wrapping for clients in the Hunter Valley, she often sees drivers slow down to watch the Fusion Vario.